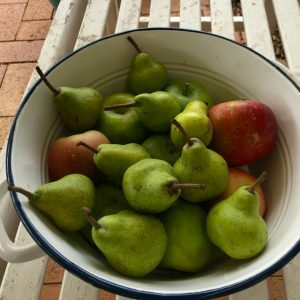 Our recent trip out to Stanthorpe, three hours north-west from where we live, took us into the heart of a cool climate wine and orchard growing area – and, at this time of year, laden apple and pear trees that are dripping with ripe fruit. 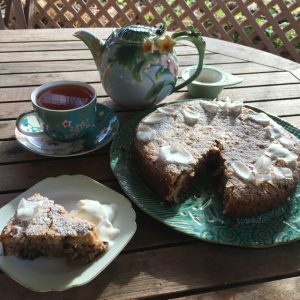 In fact, right now our local Mullumbimby Farmers Market is full of this luscious autumn harvest where I picked up a load of baby pears for baking, some delicious eating and cooking apples and a bag of freshly picked pecans – then I thought of this cake. With a busy family, I am often wearing my grandma hat to my seven little darlings and picking them after school, which means the first thing they are going to ask me when they walk in the door is “what is there to eat”. A vegemite sandwich is good, but homemade cake puts a real smile on their little faces. This cake may seem a little strange (coconut?? ), but go with me – it’s really good. I’ve made it a few times now and refined the recipe so its easy to make and doesn’t involve three processes and as many bowls – not the kind of recipe for me! It was also an opportunity to get out my favourite teapot. Peel and cut apples into small chunks. Add to lemon juice and set aside in LARGE mixing bowl. Add sultanas to the apple mix. Toast pecans in oven for 5 minutes. At the last minute, add the coconut and toast with the pecans FOR ONE MINUTE ONLY – otherwise it will burn. 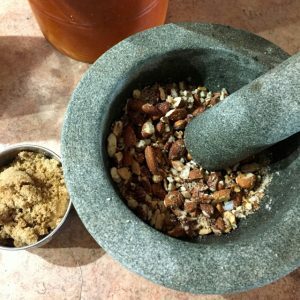 Tip pecans, coconut and 1 tbs of brown sugar into mortar and pestle and lightly crush. The smell, at this stage, is divine! In a food processor, cream together the butter and 1 cup brown sugar until light fluffy. Tip this mixture into bowl with apple mix. Add Amaretto and fold all together. Add pinch of salt. Turn the mixture into prepared cake tin. Bake in centre of oven on 180oC for about 45 minutes or until cake is firm to touch and skewer comes out clean. 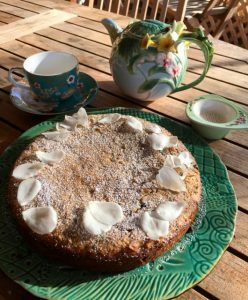 NOTE: I recently read an interesting memoir by Italian/Aussie, Zoe Boccabella, called Mezza Italiana whose grandfather migrated to Australia as a 14 year old and became an apple orchardist in Stanthorpe Well worth a read – has family recipes in it too and this cake was evocative of her story.